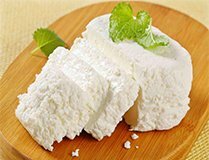 Ricotta cheese originated from Italy, and in Australia, it is made from skim or whole cow’s milk. It is slightly grainy, white, moist and has a slightly sweet flavour, making it ideal for desserts such as cheesecakes. Most ricottas are made from the whey that is drained off while making cheeses such as mozzarella.